I am fairly confident in the belief that the world is replete with bad condiments. And we need to fix that, starting with this Pistachio Mint Pesto. I don’t know if you could even consider pesto a “condiment” — it’s more of a spread, or a sauce, or something you can spoon directly into your face. But in the case of this pistachio mint pesto, it covers all the bases. You can dip fries into it. You can spread it on a burger. You can spoon it over chicken or steak or raw vegetables. You can put it in an omelette and eat it for breakfast. 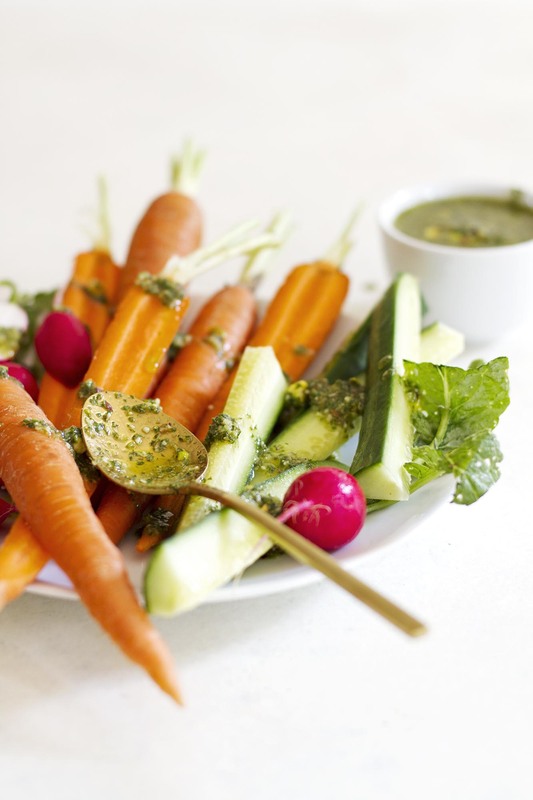 My point is, what we lack in good condiments we can make up for with these easy pesto recipe. The combination of pistachio and mint in a pesto isn’t much of a novelty, but it is more exciting than the old basil and pine nut standby. The flavors are a little sharper, tangier, nuttier. It toes the line of chimichurri sauce but still maintains that classic oily pesto consistency that makes it so tasty and so versatile. Have I delved too far into pesto description territory? Probably. It’s just that I love this pesto so much, I can’t stop talking about it. ANYWAY, in these lazy, hazy days of summer, there is nothing better than grabbing a jar of homemade pesto from the fridge and adding it to simple grilled chicken or vegetables and calling it dinner, amiright? It’s fancy enough for a dinner party but easy enough to make for a quick weeknight meal on the fly. Got some pasta? Add this pesto to it. Got some salad? Toss it with this pesto. If you’re brave enough to bake these days (or just can’t live without oven-baked goods, dat’s me), stir a few spoonfuls into your savory scones or cornbread. You’ll never be sorry about doing that. 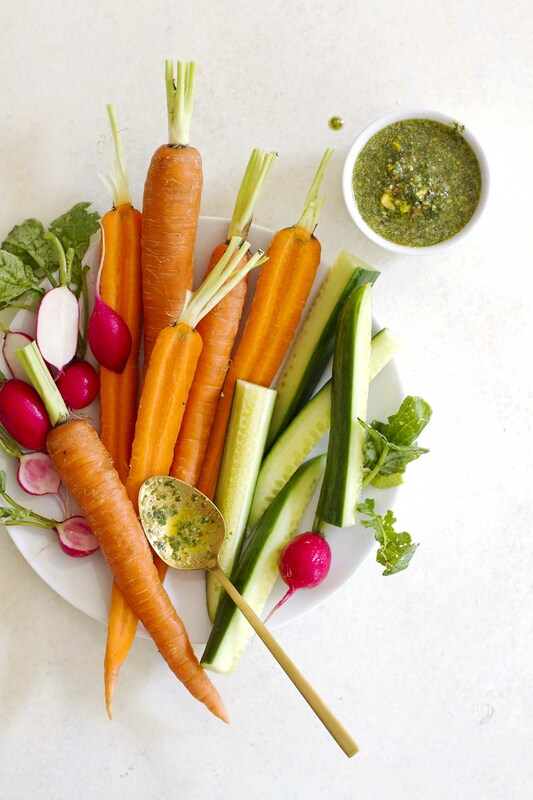 If I were you, I’d skip the ketchup and mustard situation for the rest of the season and just go full-on pesto. It’s the right thing to do. 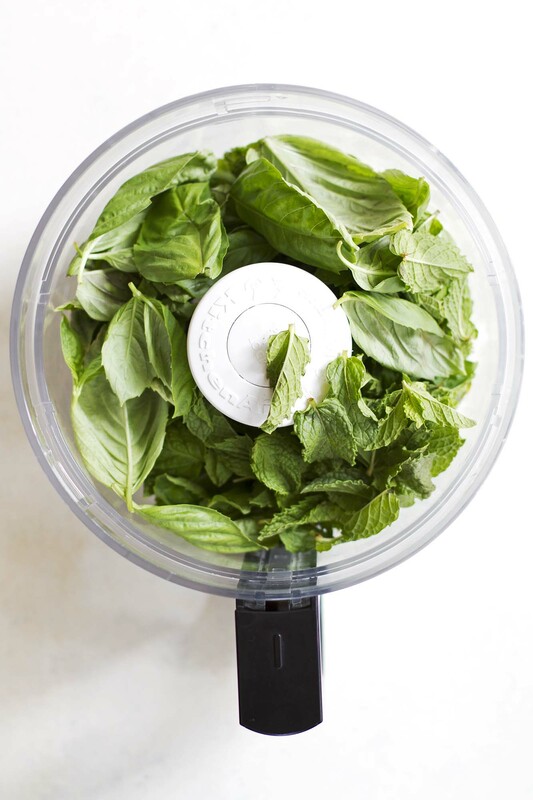 In bowl of food processor, process mint and basil until very finely chopped. Add grated cheese, shallot, salt, pepper, lemon juice and olive oil. Process until well combined. Add pistachios and process until pistachios are mostly chopped but left a little chunky. Refrigerate pesto at least 1 hour before serving. 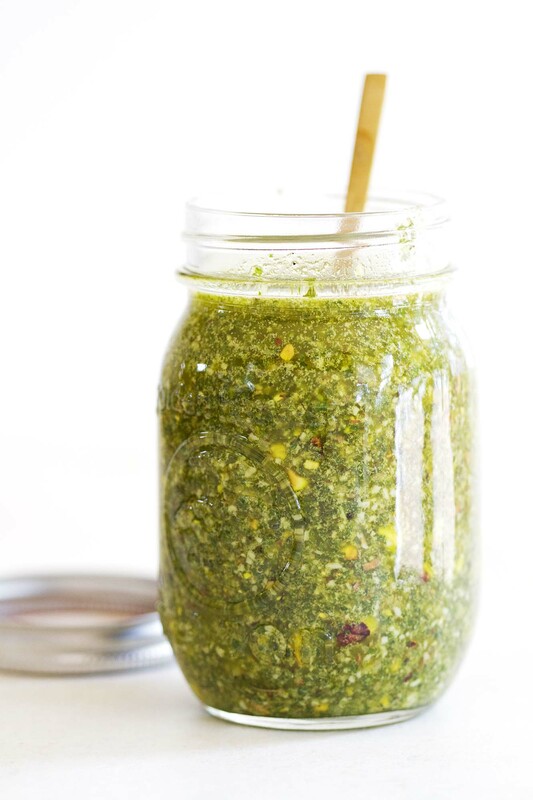 Is it weird that I’m fantasizing about drinking that jar of pesto through a straw? 😉 I could seriously put this pesto sauce on e’erythang! 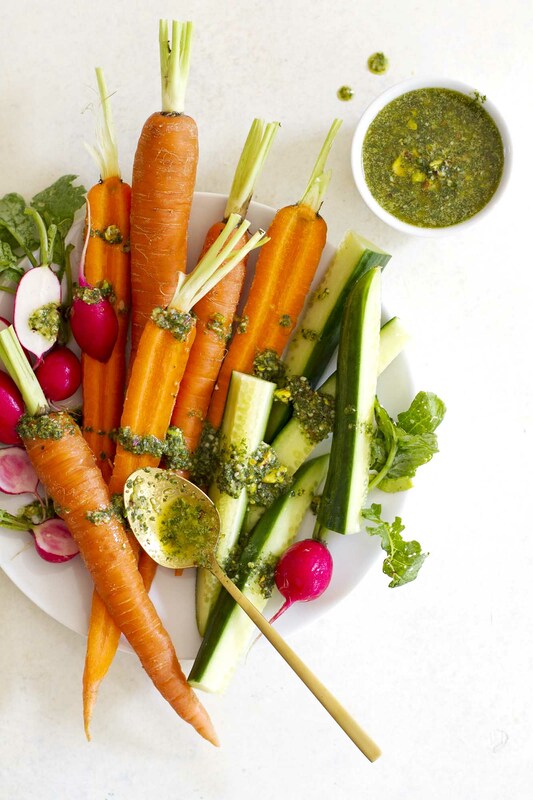 Why do I not ever drizzle pesto over raw veggies? Or for heavens sake dip fries in it??? This is amazing. Need. Good sauces and condiments make good cooking a lot easier, and this one looks like an absolute winner. I bet it would be great even thinned out with some olive oil and lemon juice and tossed over a salad. Allyson — Could not agree more. And yes, it would be amazing on a salad! Can’t wait to try this! Love the sound of the pistachio mint combo! Woah, that’s such a fun mix of flavors! I can’t wait to try! I made this yesterday and even without the lemon juice it is very yummy! Put it over angel hair pasta. Nutty minty mouthfuls of Oh My Gosh! Please be careful with the salt. If you accidentally get roasted and salted pistachios, don’t salt as much. This is going to be a regular for me! Schnackies — Oh yay! I love it over pasta. Thanks so much for your comment! Which mint is best, spearmint or peppermint Leaves with this recipe? Lorene — Peppermint is best!